“Today I voted with President Trump and Secretary Mattis to halt sequestration and increase defense spending. My vote is for our men and women in uniform who are relying on this boost in defense resources to carry out their mission and to keep us safe. Eight years’ worth of anemic defense budgets and neglect under President Obama’s defense sequester have thrown our military into a full-blown readiness crisis—and Secretary Mattis has made it very clear that, unless we pass a budget and fund the troops they will not have the resources to maintain their operations and deter war. That’s why, from the outset, I demanded that this bill include $700 billion this year and $716 billion next year for our troops to fulfill our military’s request—and it does. This bill also dismantles another pillar of Obamacare: The ‘Independent Payment Advisory Board’—also known as the Death Panels and tasked with rationing Medicare. 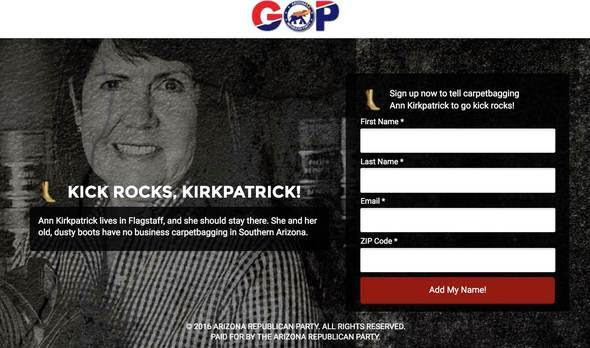 PHOENIX (May 26) — The Arizona Republican Party today launched a petition in response to the petition being circulated by Arizona democratic operatives who want to draft Ann Kirkpatrick in Arizona’s second congressional district. The so-called “Affordable Care Act,” better known as Obamacare, has been a disaster any way you look at it. First, it promised to bring down the cost of healthcare for middle class Americans. Wrong: premiums and other out of pocket costs continue to sore. Second, President Obama promised people that if they liked their healthcare or their doctors, they could keep them. As we all know that has proven to be false as well. As with most complicated federal programs, Obamacare created more red tape, more bureaucracy, created higher costs, and created shrinking healthcare options. With less competition, costs seem poised to sky rocket even further. The political facts demonstrate that the American people, and certainly Arizonans, are opposed to Obamacare. First, in 2010, Republicans took the majority of the House in one of the largest electoral shifts in American history. Then in 2014, they reclaimed the Senate. Both did so on a platform of fixing, repealing, or replacing Obamacare. With just weeks to go before the 2016 Presidential election, in states like Arizona, many people received notice that they were going to lose their healthcare in 2017. The plan simply didn’t work for many insurance companies and doctors. Obamacare promised coverage and yet many Arizonan’s were two months away from losing coverage. The new Republican healthcare alternative has had its detractors but here are the facts about the bill. It will create more competition in the marketplace. This will give consumers more options and lower costs. It will allow people with pre-existing conditions to have healthcare. It will provide a stable transition so that people can keep coverage as they move to the new plan. In Arizona, we should applaud Congresswoman Martha McSally, Congressmen Trent Franks, Paul Gosar, and David Schweikert for supporting this bill. It is a promise kept to voters and shows a real recognition that the current healthcare system is unsustainable and unworthy of the greatest nation in the world. 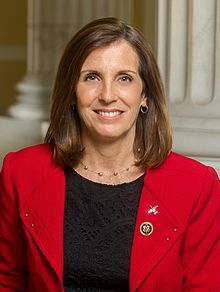 Congresswoman McSally should garner special mention for her leadership. She is getting criticized for her vote but she is doing what she promised the voters she would do. She also fought for the interests of ALL Americans by adding an amendment to eliminate healthcare exemptions for members of Congress. We should be very proud of our Congresswoman McSally and those Republicans who stood up for lower health care costs for all Arizonans. We applaud her service to her constituents. TUCSON – U.S. Representative Martha McSally today released the following statement after a C-130J crashed shortly after takeoff from Jalalabad Airfield, Afghanistan, killing six Airmen and five civilian passengers including Tombstone native Carlos Carrasco. Carlos Carrasco was raised in Tombstone, Arizona and graduated from Tombstone High School in 2006. He worked as a contractor for Northrop Grumman in Sierra Vista and was serving in Afghanistan as an unmanned aerial vehicle (UAV) mechanic and technician. He previously earned degrees in Avionics & UAV Technology from Cochise College. TUCSON – Retired Air Force Colonel Martha McSally today announced the members who will serve on her Transition Team. The diverse group of experts and community leaders from Pima and Cochise Counties will provide input on hiring decisions and help set up McSally’s Arizona Congressional offices to ensure a smooth transition to office. The Transition Team consists of members from across the political spectrum who bring diverse backgrounds, experiences, and expertise to the group. Short bios for each member are listed below. Jim Kolbe (Honorary Chair): Congressman Kolbe represented Southern Arizona in the U.S. House of Representatives for twenty-two years, where he served on the Appropriations and Budget Committees. Congressman Kolbe currently serves as Senior Transatlantic Fellow for the German Marshall Fund of the United States, a co-chair of the Transatlantic Taskforce on Development, and a Senior Adviser to McLarty Associates, a strategic consulting firm. He also serves on the boards of numerous community organizations including the Community Food Bank and Critical Path Institute. Chris Sheafe (Chair): Sheafe is President of C. Sheafe Co. and has lived in Southern Arizona for nearly four decades. In addition to his many years of experience as a successful developer, Sheafe has served on the Tucson International Airport Authority, Pima County Bond Committee, the Southern Arizona Home Builders Association, the Rio Nuevo Board, as well as The Southern Arizona Water Resource Association and Tucson Regional Water Council. Lea Marquez-Peterson: Marquez-Peterson is the President/CEO of the Tucson Hispanic Chamber of Commerce and is the owner and Designated Broker for Marquez Peterson Group, LLC. In 2011, she was appointed by President Barack Obama to the National Women’s Business Council, a group that advises the President and Congress on issues facing women business owners. She serves on numerous community boards including Vantage West Credit Union, the Pima County Workforce Investment Board, and the Arizona Chamber of Commerce and Industry and is a member of DM-50 and the Tucson Airport Authority. Tim Bee: Bee is the Vice President, Government and Community Relations for the University of Arizona and the former President and Senate Majority Leader of the Arizona Senate. He was appointed to serve as Director of Governor Jan Brewer’s Southern Arizona Office and prior to that, owned and operated his own business in Tucson. Keri Silvyn: Silvyn is Partner/Owner at Lazarus, Silvyn & Bangs PC and was named Tucson’s “Woman of the Year” in 2014. Her area of legal practice focuses on land use and infrastructure, and she is the founder of Imagine Greater Tucson whose mission is to connect government, stakeholders and community to create community-driven choices for living, working, learning and playing in the Tucson region. She is a former President of the Jewish Community Foundation of Southern Arizona and involved on the Boards of the O’Connor House Project, TREO, Tucson Metropolitan Chamber of Commerce, the University of Arizona Law College Association, and the Tucson Medical Center Foundation Board. Bill Assenmacher: Assenmacher is the CEO of Caid Industries, Inc., a mining and metal fabrication company founded in Southern Arizona in 1947. He is the founder and President of the Southern Arizona Business Coalition and serves on the boards of AMIGOS, The New Centurion Foundation, and the Tucson Chamber of Commerce, among other groups. He previously served on advisory boards for the University of Arizona College of Engineering and the State of Arizona Commerce Authority. Vera Marie (Bunny) Badertscher: Badertscher, a freelance writer and author, served as District Chief of Staff for Rep. Kolbe for eight years and was first Chief of Staff for Gov. Symington. She was campaign manager for U.S. Rep. Jim Kolbe’s first four campaigns, and for Governor Fife Symington, Tucson Mayor Lew Murphy, and others. Badertscher also ran a political consulting firm for several years. Edmund Marquez: Marquez is the agency owner for Allstate Insurance and former owner of Edmund Marquez Suzuki in Tucson. He is a past Chairman of the Tucson Hispanic Chamber of Commerce and a member of the Southern Arizona Leadership Council and has served on the community boards for YMCA, the Pima Community College Foundation, the Greater Tucson Fire Foundation, and the DM-50. Julie Katsel: Katsel currently serves as Southern Arizona Director for U.S. Senator Jeff Flake and served prior to that as Deputy Regional Director for U.S. Senator Jon Kyl for 18 years and for Congressman Jim Kolbe on his Washington, D.C. staff. A UA graduate, Julie has a long history of community service in Tucson and is currently active on the Board of Directors of the Catalina Council, Boy Scouts of America. Judi White: White is the past chair of the Pima County Republican Party and serves on the Executive Committee of the National Rifle Association’s Women’s Leadership Forum as well as on the Board of Governors of the Dodie Londen Excellence in Public Service Series. She has extensive experience working with candidates for elected office. Jeff Utsch: Utsch is the President of Tucson Acquisition and Development Corp., a former USA National Swim Team Member and All-American swimmer and Team Captain at the U of A. He has served for 20 years as a consultant with the Naval Special Warfare community teaching military personnel in tactical swimming applications. He has previously been a director and ambassador for the Navy SEAL Foundation, is a member of The Compact for America, and teaches on the U.S. Constitution. Larry Lucero: Lucero is Senior Director, Government Relations and Economic Development at UNS Energy Corporation, Tucson Electric Power. He was appointed to serve on the Arizona State Board of Education and Border Governor’s Conference by Governor Janet Napolitano and currently serves as President for the Arizona Mexico Commission and as a board member for Tucson Youth Development, Alternative Computer Education Charter High School, and the Chicanos Por La Causa Tucson Advisory Council. Pam Harrington: Harrington served as District Scheduler/Executive Assistant to Congressman Jim Kolbe for 17 years and District Scheduler for Congresswoman Gabrielle Giffords for 5 years. She has served with local elected officials and candidates since 1975. Bob Ramirez: Ramirez is the President and CEO of Vantage West Credit Union and has lived in Tucson since 1979. He has served as Chairman of the Credit Union Executive Society Board of Directors and is involved in numerous community organizations including the Tucson Chamber of Commerce, the DM-50, Pima Community College Foundation, and the Ronald McDonald House Charities. Si Schorr: Schorr is a Senior Partner at Lewis Roca Rothgerber. He has served as first Chair of the Regional Transportation Authority, Chair of the Arizona State Transportation Board, and Chair of the Tucson-Pima County Commission on Improved Government Management. He is a Board member of the Tucson Airport Authority. He also is a founding Board Member of Pima Community College and the Southern Arizona Leadership Council. Judy Patrick: Patrick is a member of the Board of Directors for CopperPoint Mutual Insurance, Tucson Regional Economic Opportunities, Tucson Airport, and Southwestern Fair Commission. She has served on the Pima County Self Insurance Trust Fund, City of Tucson Civil Service Commission, City of Tucson, and Public Safety Retirement Board and is a member of the National Association Corporate Directors and National Association Mutual Insurance Companies. Joe Snell: Snell is President of Tucson Regional Economic Opportunities (TREO) and prior to that was President of Metro Denver Network. He is a Board Member for the I-11 Coalition and has served as Co-Chair of the Economic Development Council for the Arizona – Mexico Commission as well as on the Board of Arizona Economic Resource Commission, the Board of the Arizona Association for Economic Development, and as Chair of the Arizona Global Network. Daisy Jenkins: Jenkins is President of Daisy Jenkins & Associates, LLC. She is Vice Chair for United Way of Tucson and Southern Arizona and is a member of the Tucson Airport Authority and University of Arizona College of Law Board of Visitors. She also is Chair-emeritus of the University of Arizona President’s African American Community Council and serves on the City of Tucson Human Relations Commission. Bob Walkup: Mayor Walkup served as Mayor of Tucson for twelve years and also is the former chairman of the Tucson Economic Council. Prior to that, he worked as an engineer and executive in the aerospace industry for 35 years and is a U.S. Army veteran. Sharon Bronson: Supervisor Bronson serves as Pima County Supervisor, District 3, and Chairman of the Board of Supervisors, and has served as President of the County Supervisor’s Association of Arizona and the U.S./Mexico Border County Coalition. She serves on the Board of Directors for Tucson Regional Economic Opportunities, Inc. (TREO), is a board member of the Metropolitan Tucson Convention and Visitors Bureau (MTCVB), and is currently on the Environment, Energy and Land Use Steering Committee for the National Association of Counties, (NACO). Tom Warne: Warne is a local Tucson commercial real estate developer, who has developed in Tucson and Phoenix since the late 70’s. He has developed commercial office space, industrial space and retail and is most proud of the Main Gate Square, a private-public partnership, which comprises approximately 1,000,000 sq. ft. of office, hotel and retail space. Joe Stroud (Sierra Vista Chair): Stroud is President of E.F. Financial, Inc. in Sierra Vista, where he’s lived since 1994. Stroud has served on the Arizona Board of Appraisals and the Sierra Vista Planning and Zoning Commission and served 30 years in the U.S. Army, retiring as a Colonel. Rick Mueller: Mayor Mueller has served as Mayor of Sierra Vista since 2010 and is a former Army Field Artillery Officer. He is a member of the Executive Board for the League of Arizona Cities and Towns, the Community Advisory Council for the Boy Scouts of America, and the Huachuca 50 and is a Board Member for the Sierra Vista Economic Development Foundation. Mayor Mueller also is a Commissioner on the Arizona Military Affairs Commission and Vice-Chairman of the Upper San Pedro Partnership. Shay Saucedo: Saucedo is the Southern Arizona Outreach Coordinator for U.S. Senator John McCain. She served as District Aide for Jim Kolbe for 11 years and as Constituent Services Manager for Congresswoman Gabrielle Giffords and Congressman Ron Barber for nearly 7 years. She has resided in Southern Arizona for 23 years. Randy Groth: Dr. Groth is the CEO at AllSource Global Management, LLC as well as the Civilian Aide to the Secretary of the Army for Arizona, a position he has held for nearly 12 years. He earned his PhD from the University of Arizona and served as an Associate Vice President at the University of Arizona and the first Dean of the University of Arizona South. Pat Call: Chairman Call is serving his fourth term as a Cochise County Supervisor, District 1, where he also serves as county liaison to the Huachuca 50, Chair of the Upper San Pedro Partnership Advisory Commission, advisor to the Hereford NRCD and represents southern Arizona on the Arizona Department of Homeland Security’s Southern Regional Area Council. He is the Executive Director for The Cochise Water Project and is a past Governor’s appointee to the Arizona Growing Smarter Oversight Group, the Statewide Water Advisory Group and Arizona’s Water Resources Development Committee. Alesia Ash: Ash grew up in Sierra Vista, where she served on the city’s Youth Commission and graduated from Buena High School before attending Arizona State University. She served as Constituent Services Representative and Outreach Coordinator for U.S. Congressman Ron Barber prior to running for office. Ash was elected to the Sierra Vista City Council in August 2014, becoming the youngest person to ever earn a seat on the Council. Jack Blair: Blair is the Chief Member Services Officer at Sulphur Springs Valley Electric Cooperative and has lived in Sierra Vista for 15 years. He is the Chairman of the Cochise Water Project and Chairman-elect of the Sierra Vista Chamber of Commerce, and on the board of directors for the Huachuca 50. He served as the past Chairman for the Sierra Vista Regional Health Center Foundation and was appointed to Governor Jan Brewer’s Solar Task Force. He also is an Army veteran. Danny Ortega: Mayor Ortega is Vice President of Ortega’s Stores Inc., a family owned business established in 1923 in Douglas, where he has served as Mayor since 2012. Prior to that, Mayor Ortega served 12 years on the Douglas Unified School District, including six years as school board President, and has been an active member of the Douglas Chamber of Commerce, Cochise County Planning and Zoning Committee, Douglas Noon Lions Club, Douglas Community Area Fund, and Douglas Clean and Beautiful. John Ladd: Ladd is a fourth generation Arizona rancher whose ranch borders 10 miles of the U.S.-Mexico border. He is a member of the Arizona Cattle Growers Association, Cochise-Graham Cattle Growers, Arizona Cattle Growers Border Committee, the Cochise County Public Lands Advisory Committee, and the Hereford Natural Resource Conservation District. Two new ads just launched in Arizona’s first and second congressional districts. The National Republican Congressional Committee posted these on their independent expenditure YouTube channel. We thought you’d appreciate them. Also note that Republicans are now messaging a strong national security theme with voters.